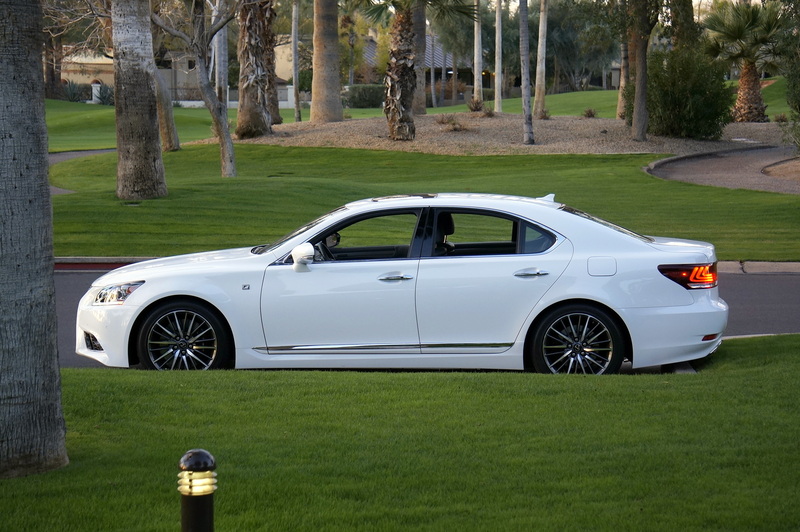 This past week I was presented a 2013 Lexus LS460 F Sport four-door sedan for testing while travelling in and around Phoenix, AZ on a working vacation. It was painted Starfire Pearl (white) metallic and inside it was trimmed in black perforated leather. Of course, the car seats five comfortably because the LS (M.S.R.P. $81,990) is big, with a wheelbase of 116.9” and an overall length of 200”. Weight is 4,400 lbs. Boy, did the LS operate with a great deal of aplomb on the turnpikes in the Valley of the Sun! It had the blind spot monitor, lane departure warning, adaptive cruise control, navigation (12.3” screen! ), 10-speaker Lexus stereo with satellite radio, Bluetooth, Lexus Enform app suite, and power tilt/telescope (and heated) steering wheel. All the windows powered up or down (out of sight), the mirrors folded in when the car was locked and of course a proximity key fob and pushbutton starter button were on hand. The front buckets were superb and adjustable in 16 (driver) and 12 (passenger) ways. Also, the embossed (F Sport) headrests powered up or down, just like the windows. Aluminum trim is present in the cabin on door panels, dash, and on the pedals, as well. Stitched leather was all over inside, including some real fancy door panels. The engine for the LS with rear-wheel drive is a 4.6 liter, 386 horsepower V-8 with a fuel economy rating of 16-city, 24-highway, and 19-overall miles per gallon. Behind it is an eight-speed sequential-shift automatic transmission with manual control-capability and steering column-mounted paddle shifters. I’ve never driven a car with such a transmission – a truck, yes, but not an automobile. It provided silky-smooth acceleration, and reportedly the LS will go zero to sixty in 5.4 seconds and top out at 130 mph. The F Sport rides .39” lower than the standard LS on an air suspension setup, but provides a fun, somewhat aggressive handling package, particularly when Sport S+ mode is selected on the console. As mentioned, the finish of the car was a striking, metallic white and up front resided LED lighting for day or night attention. The grill is a specific F Sport blacked-out egg-crate design in the new six-sided Lexus manner, and big air intakes surround the front fog lights. Taillights have three “L’s” molded within each, and an appropriate amount of chrome is all around the car. The wheels were 19” split-ten-spoke forged alloys by BBS surrounded by 245/45R19 summer radials. Behind them could be seen the big Brembo 14.8” ventilated disc brakes. They provided plenty of Whoa! to go with all the Go! The twin exhausts puffed out of two sculpted chrome finishers molded into the rear fascia. As a car to enter into freeway traffic in America’s sixth largest city on a weekday, I cannot think of a better choice than the 2013 Lexus LS460 F Sport. For dropping off the wife in front of the toney El Chorro Restaurant in Paradise Valley to have dinner; same car.